"Broadcast your screen to a group of computers on a LAN connection with TightProjector." 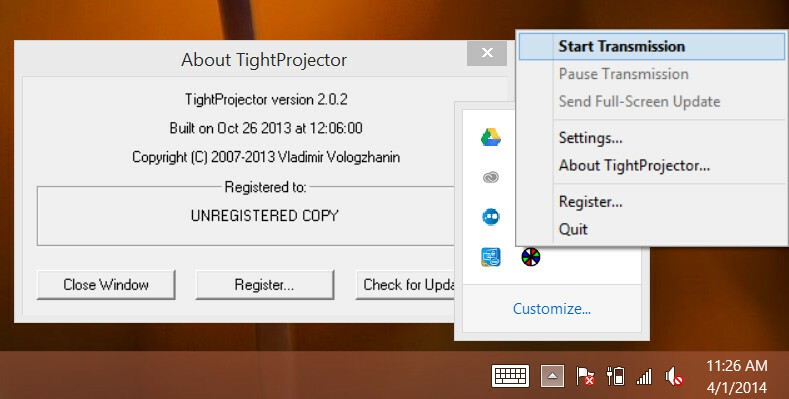 TightProjector is a software for your PC that will allow you to broadcast your screen on your computer or of a particular computer the Local Area Network (LAN) that it is connected to. Reasons why one may wish to use a software like this one generally include, but are not limited to: broadcasting a presentation to multiple computers during a meeting for which a traditional projector is unavailable or too far away for one to look at comfortably and showing a class of students operations performed by their teacher again for when a traditional projector is unavailable. or maybe people would like to simplify their custom note taking habits. There are two programs bundled into this one program. They are the TightProjector and the TightReceiver. The TightProjector sends the screen's contents to the network and I'm pretty sure you could take a wildly close guess at what the receiver does. It shows the data received from the TightProjector. The TightProjector is the client program while the TightProjector is the server. There can be many clients receiving information from the TightProjector while there can only be one server broadcasting out to several clients. This is acheived without high data costs. This is because TightProjector uses multicast UDP packets when it sends screen updates. The use of multicast UDP packets means that the clients do not need to establish connections to the server directly to receive the packet. The server sends one packet which reaches the client. Even if there are several clients, that one packet reaches them all.